It’s a homeschool family-friendly earth science series with lots of hands-on activities. Your student can study the ocean, earth’s landforms, and space! An Ebook version is now available for each book in the Great Science Adventures Series. In Discovering Earth’s Landforms and Surface Features, you student will study the physical features of Earth, lithosphere, earthquakes, mountains, volcano, tsunamis, rocks, fossils, minerals, soil, erosion, caves, glaciers, rivers, lakes, coastlines, deserts, and more. 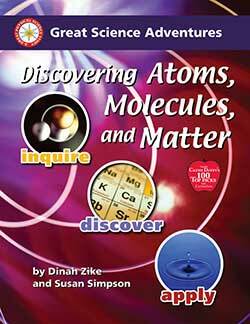 Like the other books in the Great Science Adventures, this book is formatted with the hands-on activities and the little Science Library books. Why buy Discovering Earth’s Landforms and Surface Features E-Book? Why buy the Materials Packet E-Book for Discovering Earth’s Landforms & Surface Features? It’s the perfect companion to the printed version of Discovering Earth’s Landforms & Surface Features.